This is a fine study; it is deep, clear, and useful. 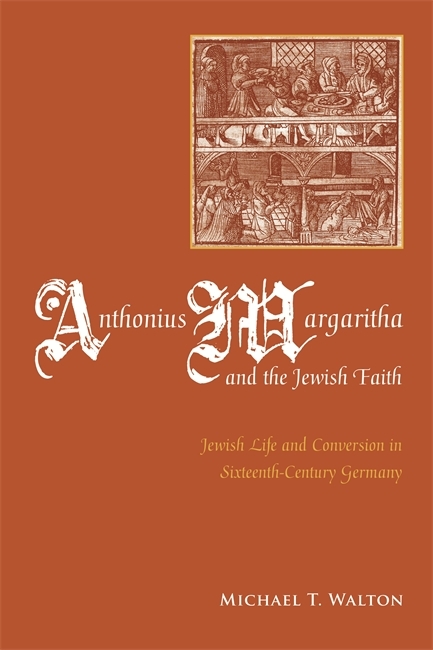 Born in the 1490s, Anthonius Margaritha was the grandson, son, and brother of noted rabbis and was perhaps the best-known Jew of his generation in Germany to convert to Christianity. When he became a Christian in 1521, he began a series of writings that were built on his Jewish life and learning but were intended to reveal the defects of his former faith. These writings, including a translation of the Hebrew prayer book into German and a refutation of the faith, The Entire Jewish Faith (Der gantz Jüdisch glaub), are well known to scholars, but Margaritha himself has been studied largely as an ethnographic type. In Anthonius Margaritha and the Jewish Faith: Jewish Life and Conversion in Sixteenth-Century Germany, author Michael T. Walton looks more closely at Margaritha's life with the help of archival research and Margaritha's own writings. To present a full picture of Margaritha, Walton examines his life both before and after conversion. Walton details Margaritha's family history and Jewish life in a Christian Germany, including social customs and worship practices. After conversion, Walton examines Margaritha's time spent as a Hebrew teacher, polemicist, and paterfamilias and analyzes Margaritha's various works for their ethnographic and scholarly-polemical content. One thread that runs through Margaritha's life and writings, detailed here, is the importance to him of his debate with noted rabbi Joseph of Rosheim. Margaritha lost the debate and was imprisoned, but he continually referred to the issues raised and defended the correctness of his position in his treatises. Ultimately, this biography reveals Margaritha as a man who converted out of genuine conviction, but whose life thereafter must have been much different from what he anticipated. Scholars of Jewish and Christian history as well as those interested in German history, Hebrew pedagogy, and religious conversion will appreciate this thorough study. Michael T. Walton, PhD, is an early modern historian who has published numerous book reviews, articles, and book chapters. He is the author of Genesis and the Chemical Philosophy: True Christian Science in the Sixteenth and Seventeenth Centuries and has edited, with Allen G. Debus, Reading the Book of Nature: The Other Side of the Scientific Revolution. This is an enjoyable book that analyzes the complex circumstances of an influential early modern convert, introduces scholarship that was published in German to an English-reading audience, and provides welcome new perspectives. The strength of this study lies primarily in his translation and in-depth analysis of sections of Margaritha's writings in the appendices, which make up half the book's length. . . Scholars and students alike will find the appendices particularly helpful in gaining a better understanding of how a Jewish convert to Christianity articulated the central rituals and practices of early modern Judaism for a Christian audience. Walton's Anthonius Margaritha and the Jewish Faith: Jewish Life and Conversion in Sixteenth-Century Germany is an intriguing examination of both Margaritha the Jew who converted to Christianity and his extremely influential portrayal of Judaism in sixteenth-century German-speaking Europe. Walton demonstrates that Margaritha was a 'faithful reporter' of both the legal and customary practices of Judaism in his own time, written from the perspective of the son of an elite rabbinic family. Since so few first-person Jewish accounts survive from this period, Walton's skillful use and partial translation of Margaritha's book will be tremendously useful both to scholars and to students. Margaritha is one of Judaism's best-known apostates. His writings have been mined for information about sixteenth-century Jewish practice, the Jewish community, polemics, and the life of a Reformation-era convert. Now Dr. Walton brings his impressive scholarly attention to Margaritha as an individual struggling to negotiate a multi-confessional German society, ambivalence toward two faiths, and the burden of a rabbinic family. This is a fine study; it is deep, clear, and useful. Walton takes the infamous Margaritha/Margoles seriously from both religious and ethnographic perspectives, weighing descriptions of German-Jewish practice carefully against what we know of early modern Jewish life and ritual. Only a scholar of Walton's erudition in both Jewish history and religion and in general early modern history could have managed this very useful analysis of a landmark in anti-Jewish polemic by a former Jew. Walton's account of Jewish life and experience as seen through the eyes of a learned convert to Christianity is a bold contribution to a mature and self-confident Jewish historiography. This book breaks new ground in elucidating the fateful religious encounter between Christianity and Judaism in the last stages of the medieval expulsions and pogroms in Germany.